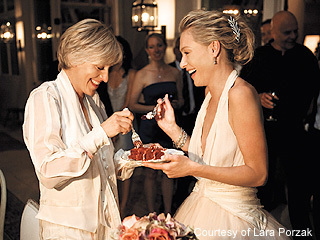 ellen & portia. . Wallpaper and background images in the Ellen DeGeneres club tagged: ellen degeneres portia de rossi wedding. This Ellen DeGeneres photo contains 명예의 신부 들러리, 하녀, 신부 들러리, 하녀의 하녀, 들러리, 부케, 코사지, 꽃다발, posy, nosegay, and 코 사지.